This is the Mercedes-Benz Zetros, the brand’s ultra-heavy duty off-road truck. Normally found in use by the military, utilities companies, or carrying weighty things to the middle-of-nowhere, it’s a truck that has a sort-of-adventurous life performing fairly mundane jobs. Not this one though. Built by Samolot of Eurobricks this Zetros pays homage to a one-off expedition adventure vehicle created a few years ago which looks like something from The Wild Thornberrys and is possibly the coolest way ever to cross a continent. Based on the chassis found within the official LEGO Technic 8110 Mercedes-Benz Unimog set, Samolot’s Zetros forgoes the now-commonplace remote control drive and steering for a host of mechanical and powered functions. A single Medium Motor and gearbox drive three powered features; the winch, lowering rear tail-lift platform, and the side ladder, plus there’s a piston engine up front, working all-wheel-drive and all-wheel-suspension (as per the Unimog set) and a very nice-looking cab interior. There’s more to see of Samalot’s superb Zetros Expedition at the Eurobricks discussion forum – click here to join the adventure! …and split. This deeply cool Volkswagen split-screen barn-door camper van complete with canvas extending high-top comes from TLCB regular Redfern. Chrome detailing is in abundance and you can see more at Red’s photostream by clicking here. Songs for Blog Titles continues here at TLCB, and today we have a song covered by this writer’s least favourite band. The Pet Shop Boys’ hateful do-over of Village People’s ‘Go West’ fills this writer with such inner rage that the only outlet he has is to slate the musical travesty in blog that isn’t even topically related. You can suffer too if you like, by watching quite possibly the Worst Music Video Ever Made. Ever. Right, enough of that despicable ’80s synth-pop, this Volkswagen T3 Westfalia camper comes from TLCB regular Ralph Savelsberg aka Mad Physicist, and it’s absolutely packed with wonderful details. A working high-top roof, sliding rear door and a realistic interior are all included, as are a neat deckchair and cool-box for enjoying in the open air when the skies are blue. Go west in the Westfalia at Ralph’s photostream by clicking here. The world’s second favourite television RV has featured here at TLCB before, and now Flickr’s Ralph Savelsberg (aka Mad Physicist) has taken Dale’s RV from the hit AMC series The Walking Dead to a new level. This flawless recreation the classic Winnebago includes a complete interior, authentic blood splatter, a shotgun-armed Dale, and – of course – a hungry zombie. There’s lots more to see on Flickr – click here and get ready to run! We’re pretty sure that over the years quite a few custodians of Volkswagen’s iconic Transporter have been on a trip to outta space. And then woken up spooning a stolen traffic cone and smelling of something foreign. Seriously kids, don’t do drugs. 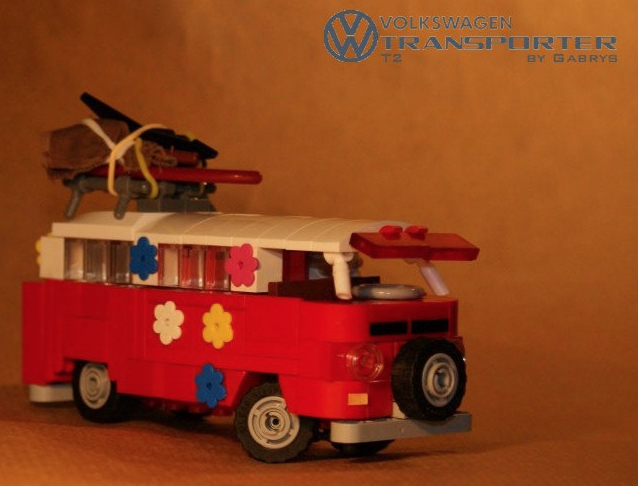 Anyway, back to the model; this neat VW Camper-esque creation comes from piratecox as part of the Febrovery fun over on Flickr, and we can only imagine what that mini-figure spaceman has got inside his ‘air’ tanks. See more via the link above. We’d steer clear of this flower-laced Volkswagen T2 camper – it’s most likely filled with smelly hippies and dirty bong water. But it does make for a neat Lego model. Filip Gabryel is the builder and there’s more to see here. 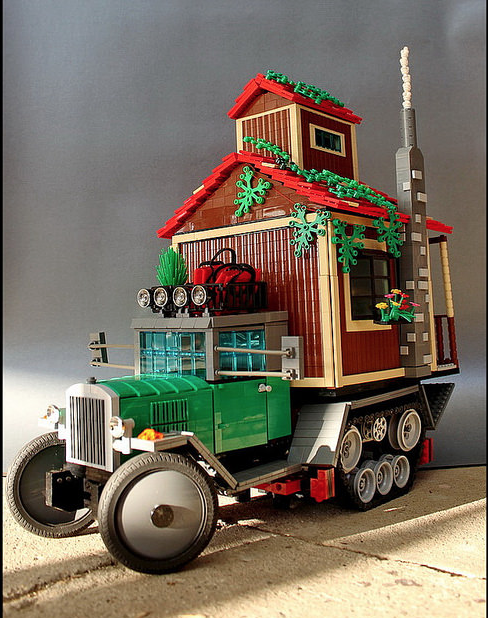 It’s not often that we see a Lego recreation of a vehicle in any state other than pristine condition. 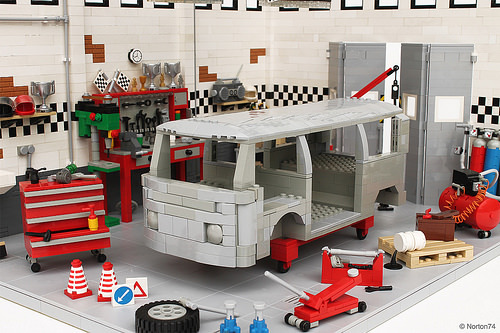 TLCB regular Norton74 has bucked this trend with a new addition to his brilliant previously blogged workshop – a fantastic bare metal Volkswagen Transporter shell. The shell itself is a neat idea, but it’s Norton’s superb garage tools which steal the show. You can see the image above – suggested to us by a reader – in full size on Flickr.